Display system. Effectively display printed material. Home / Display system. Effectively display printed material. Commonly used by real estate agents, this versatile system uses tensioned stainless steel cables to support clear acrylic holders. Suitable to hold printed material or photos. Displays can be double sided. The main advantage of our display system is that it’s easy to install because we use push-button “grippers” both to tension the cable and to adjust the acrylic holders up and down. 1. Stainless steel cables plus top and bottom anchor fittings. These fittings will adapt for use on vertical or horizontal surfaces (floor, wall or ceilings). 2. Metal grippers to support acrylic holders. Single and double grippers available. These also use the push button fitting to lock in position on the cables. Use an Allen key to fix the grippers onto the acrylic holders. 3. The acrylic holders – Stock sizes are made to hold A3 or A4 in either portrait or landscape format. Alternatively A2 Portrait . Other sizes can be made to order. Other uses for the system is to tension wires across a room for various purposes – ie, one of our customers; a pre-school uses this system to display children’s paintings. 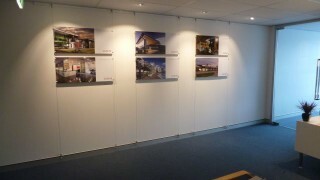 For help planning your Display System call us or email through your requirements.